This beautiful lot has shrubbery on one side and a landscaped hill at the back of the lot to provide privacy. An outdoor swing with seating for two is tucked to one side and additional seating is available around the fire pit. The raised deck allows for beautiful views while enjoying a meal. There is also a gas grill on the raised deck for your use. Apple Valley Farm is a 15-acre luxury motor coach park with 46 spaces for Class A motor coaches. Inside the park is a beautiful lake with two waterfalls and a working waterwheel. 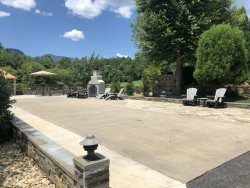 Outside the park guests can experience all Resort amenities including golf, spa, dining, swimming, tennis, and private beach on Lake Lure. Rented golf carts can not be taken to this Lot. *RV must be a minimum 32' Class A motor coach. ** No 4 wheel pull behind trailers allowed. Cars must be hitched to motor coach. Click to view special driving directions to Apple Valley Farm. Click to view Rules & Regulations for renters. Utilities including public water supply, sewer, 50 amp electric, and Wi-Fi . Paved roads and concrete pads. Privacy from the public road by a landscaped berm.